At today's Macworld Expo in San Francisco, Apple CEO Steve Jobs introduced�among other things�iLife '06, the latest version of Apple's personal digital media studio. iLife '06 includes new versions of iPhoto, iMovie HD, iDVD, and GarageBand, as well as a brand-new program: iWeb, which enables you to publish Web sites through Apple's .Mac service. I've worked extensively with iLife '06, and I've prepared a 16-page preview that highlights some of the best features in the new suite. 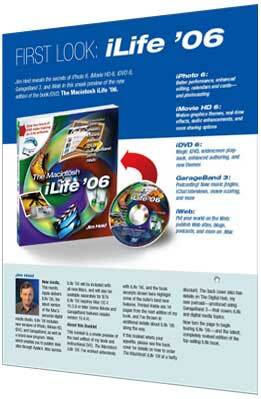 The preview contains 14 pages from the next edition of my book, The Macintosh iLife '06, as well as additional details about iLife '06. Peachpit Press is distributing thousands of these magazine-size booklets at the Macworld Expo. But if you can't make it to Moscone, I'll bring the booklet to you. Download the PDF now (4.2MB). And come back tomorrow for the debut of The Digital Hub, a semi-regular podcast�produced using GarageBand 3, of course�that deals with iLife and related digital media topics.